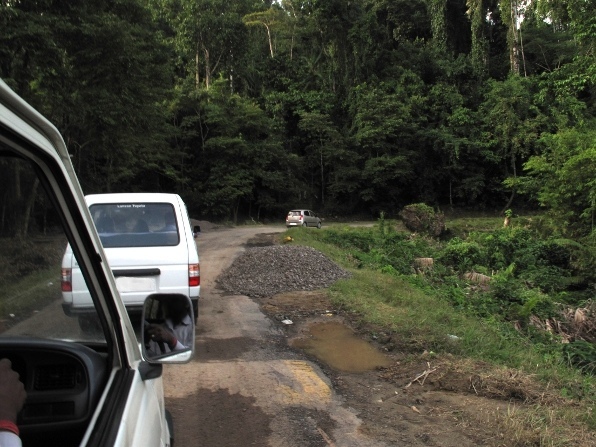 Like the proboscis of a malarial mosquito the Andaman Trunk Road pierces the Jarawa forest. The road carries a steady stream of vehicles, bunched into convoys with guards. By the road are heaps of stones and the claw marks of heavy machinery: the road will soon be wider. 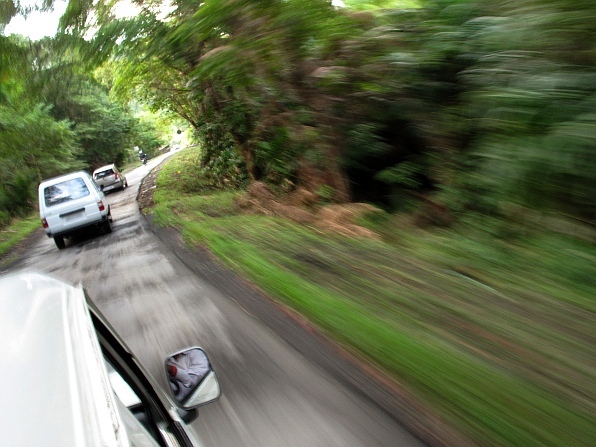 A convoy of vehicles on the Andaman Trunk Road (ATR). Just beyond, on either side, stretches the home of the Jarawa—lofty rainforests with tall dipterocarps and padauk, myriad trees and lianas, palms, cane, and bamboo. If the forest bears the human mark of the Jarawa, it is subtle and difficult to discern. Up in the trees, a flock of birds is busy hunting prey. Dressed in smart black, the Andaman drongo forages in the canopy with long-tailed Andaman treepies. The forest resounds with the territorial drumming of the black woodpecker of the Andamans, even as a spectacular dark serpent eagle cries its shrill cry skimming the skies. Towering above the other trees, an emergent Tetrameles, smooth and leafless, holds a dollarbird on a high exposed branch. 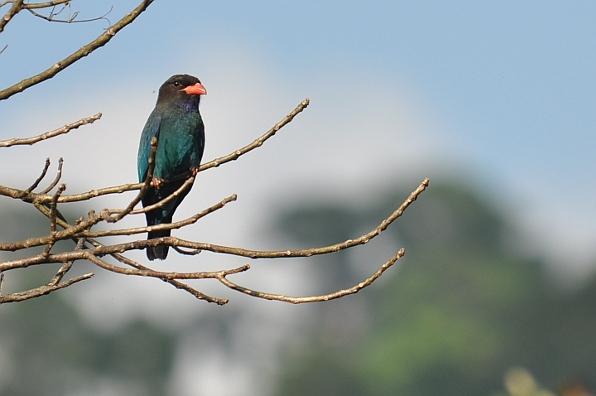 The endemic Andaman birds mark the uniqueness of the forest, but the dollarbird suggests an ancient commonality with lands across the ocean, for one can see it similarly perched atop great trees in the rainforests of the Western Ghats, in north-east India, and in south-east Asia. Dollarbird on the lookout from a leafless Tetrameles branch. The road hurtles on, like an arrow of time, past the island of Baratang, into a more open forest. 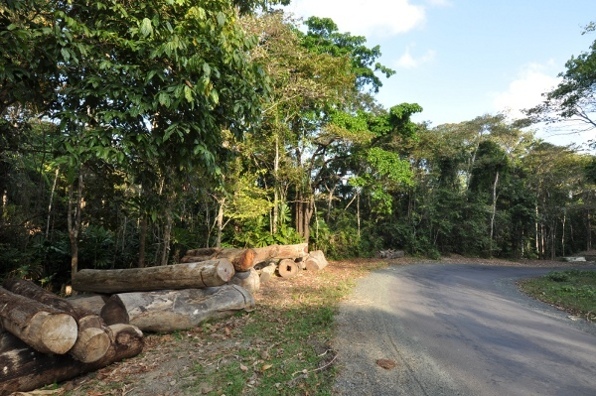 Huge logs lie by the roadside. ‘Welcome to Middle Andamans‘, proclaims a signboard of the Forest Department. The signboard is only half green—the other half is red. This forest bears the mark of a different kind of man. Huge rainforest trees cut for timber lying beside the Andaman Trunk Road. Here, the tall trees are few and scattered. Amidst remnant evergreen trees are many that are deciduous. 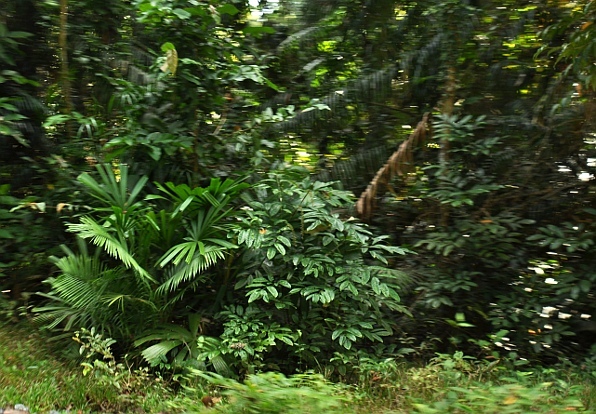 The undergrowth is dense with palms, shrubs, and saplings, in dense tangles with weeds and vines. Through the canopy, shredded by logging, sunlight streams to feed the light-hungry weeds in the undergrowth. The alien weeds thrive: the Chromolaena in dense clusters, the Mikania woven into green shrouds over saplings. The forest is criss-crossed with logging coupe roads. Some are overgrown, some erode away, but some remain, like a tenacious scar marking an old, unforgotten wound. In the forest itself, the ground is thrown up into little mounds. The mounds are covered with a fine sort of soil that termites conjure from earth and wood. Little seedlings germinate on the mounds. There is ficus, of course, but ferns and other plants, too. The mounds are rounded at sawing height off the ground. Theirs is a strangely haunting presence in the forest, like ghosts of trees past. On the forest floor all around are dotted seedlings and saplings of forest trees—pioneers, deciduous, and evergreen—a tenuous cohort presaging an uncertain forest of the future. At either end of the road are altered landscapes of settlement, agriculture and forest remnants, seeming destinations—end points—not just in space, but in time as well. Here, alien mynas and native starlings share and contest space, in the continuing biological tussle of introduced and indigenous so unfortunately frequent on islands. Crows and bulbuls, spotted deer and elephants, many animals have been brought and released here, subsequently thriving as feral populations. 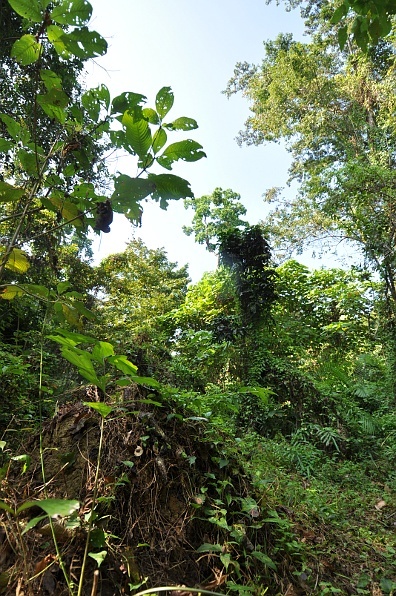 By the roadside in Port Blair and Wandoor are rain trees, another alien, festooned with bird’s nest ferns and orchids, growing luxuriantly in the humid tropical climate and soil. As people and lifeforms have arrived, the land has accommodated them, providing resources and succour. How those arriving have accommodated to the land is another matter. After a long spell of logging and a brief reprieve, the forests are on the cutting block again. The island forests rise behind a skirt of dense mangroves whose aerial roots claim purchase at the very edge of land, forming a shelterbelt from the surges of the sea. The mangroves now give way to desolate wastes and burgeoning resorts with the all-important sea-view. The sand beaches that hold the nests of turtles and the roots of manilkara trees are mined away for the homes of men and the foundations of buildings. The soils from slopes and crop fields erode into streams and into the sea to smother with silt the coral reefs—those not already bleached and crumbling from ocean warming or extraction. A tsunami came and went but the tsunami of a certain type of development continues—yet, it seems only a promise to squander in years what peoples such as the Jarawa have sustained over millenia. 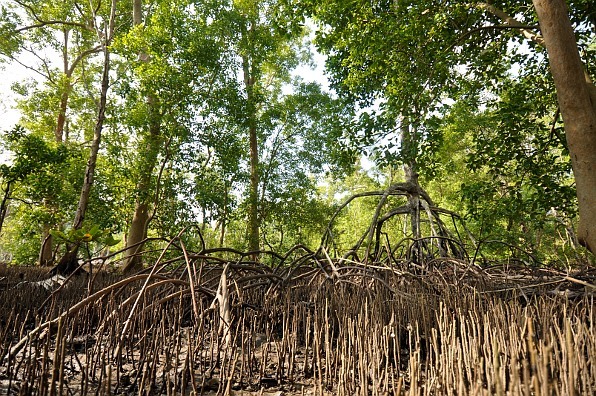 A coastal mangrove with its aerial roots: holding on to land, only to be cleared for a resort's 'sea view'? Will the spread of the alien plant and animal species into the sensitive landscape of the islands ever abate? Will the tussle over space and resource, over lifestyle and culture, among the indigenous and the settled peoples amicably resolve? And yet, isn’t alien and native a matter of perspective, too? Seen with immigrant eyes from the streets of Port Blair, the introduced myna and house crow appear more familiar than the Andaman teal or treepie. To the native Jarawa still embedded in the island ecosystem, whose name for themselves ‘eng’ means people—to them, we are the alien, people from another world barely known or understood. But to us, as people bereft of intimate connection with nature, it is the Jarawa—our name for them meaning ‘the other’, ‘the stranger’—who appears alien. And so it may remain. The Jarawa lives a world apart. A world he can scarcely construct for us without somehow losing it in the process. Unbidden, a strange feeling then appears on the journey down the road. A feeling, as if we are destined to always be second-comers, carrying an atavistic insecurity originating in early human migrations from the African savanna into new lands. As aliens forever, we cope with insecurity by revelling in alienness, seeking shelter in superiority, making it an aspirational, a developmental goal. It is our proud red against the darkling green of the Jarawa, who are people like us but who arrived in ages past, taking a path towards a destination altogether different. Our road could yet lead to a different sensitivity and perception. A sensitivity that allows us to make space for diversity—biological and cultural—on the land itself, in our hearts, our minds. A perception that we simultaneously inhabit different worlds and that a more powerful world should not trample a weaker one to the earth. By making space for survival and recovery of other peoples and other species in their natural homes, the forest of the future may be, not a forest of aliens, but a forest of the human and the humane. This article appeared in The Hindu Sunday Magazine on 1 January 2012.